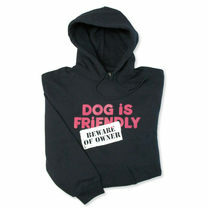 Hooded sweatshirt, 50% cotton, 50% polyester. Machine washable, L/XL (up to 46"). Hooded sweatshirt, 50% cotton, 50% polyester. Machine washable, S/M (up to 38").